The transaction fees on cryptocurrencies are lower and cheaper when compared to traditional paying platforms with Credit Cards, PayPal and others alike. SpesCoin advances on traditional currencies by providing almost no transaction fee on transactions, making it the best option for local or international transfer of funds. By using CryptoNote protocol SpesCoin is able to deliver a fast and secure payment method while being simple enough to be used by anyone, everywhere. Learn more about Ring signatures, One-time keys or Double-spending proof or Egalitarian proof of work. SpesCoin currency can be sent almost instantaneously worldwide as a secure online transaction to reach where and when it is needed. CryptoNote – a scheme that can guarantee anonymity to respondents when making a payment. The Protocol is implemented using a ring signature system that allows you to sign private messages with the group name. After you have downloaded the wallet,created your first SpesCoin address you can join one of the following mining pools by clicking on the links below. Click here to access SpesCoin Faucet!!! CameroonONE is exited about our new collaboration with SpesCoin. This new partnership will work to bring an education and healthcare in a secure family environment to orphaned children who have been reunited with their biological families in their communities of birth. 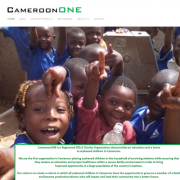 CameroonONE recognizes the value and potential that cryptocurrencies will have in the charity world as the future of transactions moves in this direction. This is a wonderful opportunity for the netizens of this world to have some positive change around the globe and we thank SpesCoin for allowing us the opportunity to amass donations for the students in our program in this manner. We look forward to this relationship and what it can offer the parentless children of this world! Thank you SpesCoin! Our vision is to enable selected non-governmental charity organizations attain their goals by empowering them to reach out directly to both the millions of children and people affected by natural disasters and people around the globe who would like to offer assistance. Want to know when we have news ? Sign up for our newsletter now!